You are here: Home / BC Christian News / November 2007 / Is Life Chain still worth all the energy? Is Life Chain still worth all the energy? 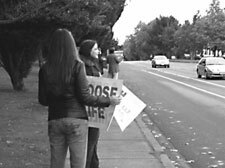 In case you missed it, pro-lifers across Canada held their annual Life Chain recently. Less than 100 from the Victoria area’s population of a quarter million showed up with text-only signs, for the hour-long stand along Blanchard Avenue. Not an impressive showing for a community which once could assemble more than 500 for this event. I think it’s time to ask: is this worth doing at all, if so few show up? Michael Green, outgoing president of Victoria Right to Life, the event’s sponsor, thinks it is. He wasn’t on Blanchard for Victoria’s Life Chain. A Cobble Hill resident, he went with his family to Duncan’s Life Chain, which drew 60 — 70 people. Green says if just one mind is changed about having an abortion, and one life is saved, it was worth it. He blames the poor showing on lack of support from churches, and gradual desensitization of Christians to abortion. Green wonders whether it might be time to adopt a more hard-hitting approach, like that of the Calgary-based Centre for Bioethical Reform. The centre mounts picture displays, usually on university campuses, that show aborted fetuses alongside the bodies of victims of the Nazi Holocaust and other mass atrocities. This hugely upsets people. 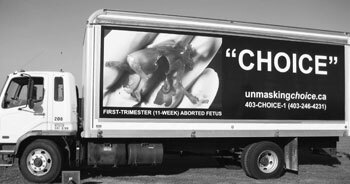 More recently, the organization has drawn the censure of Calgary’s Catholic bishop Fred Henry, for its ‘Reproductive Choice’ campaign — which sends a truck through the city with the image of a bloody fetus on its sides. In Henry’s view, the images showed disrespect for the dead. Green, a Catholic, like most of those out for Life Chain this year, also grouses about what he perceives as a lack of support from his denomination’s hierarchy. Indeed, I noticed no priests on hand for Life Chain; but neither were there any Protestant clergy. Victoria Bishop Richard Gagnon says Catholic opposition to abortion “has been consistent and clear.” His own diocese’s financial difficulties are well known, he says, and have meant that it cannot afford paid family life staff as other dioceses can. I experienced this first-hand when I attempted to contact some evangelical pastors for their views on the Life Chain turnout. Several of them did not return my phone calls. Longtime Life Chain supporter Arla Taylor, of Central Baptist Church, notes the problem isn’t Victoria’s alone. Activism needs a focus, she says. With no realistic prospect of the Conservative government countenancing an anti-abortion bill, there is no achievable goal to justify the effort. Taylor believes the movement made a strategic blunder decades ago, when a previous Conservative government introduced a law moderately restricting abortion and the movement refused to back it– leading several pro-life MPs to oppose it, and causing it to fail. Catholics like their clergy to lead; but it appears pro-life organizations aren’t providing much leadership. I’m not sure if our own priest exhorting us to attend Life Chain would have been as effective as an articulate pro-life spokesperson reminding us of the issue: that 13,000 unborn are slain in B.C. yearly. Enthusiasm is infectious. Our parish is all on fire these days over a fundraising concert to pay travel expenses for our young adults to attend an International Eucharistic Congress next year in Quebec City. It’s a big deal; but big deals are routine in the Catholic church — and I just as routinely ignore them. Not this time, however — because the chief fundraiser buttonholed me after church and gave me her elevator pitch about the group and the cause. Result: I organized a table of friends, and friends of friends, for the event. It was a first for me. On the morning of the Life Chain, one of the young people headed for Quebec delivered another pitch for the fundraiser after church. She is also a member of a nondenominational UVic pro-life group; so I asked her why there was no participation from her group in the Life Chain. Nobody from Victoria Right to Life had contacted her about it, she said. Others have confirmed her impression. Can we blame pro-life organizers for having run out of steam? I don’t think so. But I think Jesus’ instruction for us, that we have to knock if we want the door opened, applies not just to prayer — but also to requests for support from Christian congregations. These days, it would appear, nobody’s asking. We all need a wake-up call. Stephanie Gray, the founder of the Centre for Bioethical Reform, says attendance at pro-life events is going down generally in Canada. Even people who believe abortion is wrong don’t feel very strongly about it, she tells me. I think she and Green are right: we live in an age of images and feelings. People today don’t ‘get’ words, but they ‘get’ feelings. For better or worse, pictures have an indisputable impact — be they of the thumb-sucking fetus sleeping in the womb, or of the bloody, post-abortion corpse. Some people will be offended, of course, within the church. But I think we’re at a point where even a negative reaction is better than none, even if it causes divisiveness within a congregation — which, in my case, is home to plenty of pro-choicers. Fighting is preferable to sleepwalking.